Bill Evans Lake: Liz Adsit of Arenas Valley caught a 4-pound catfish Jan. 20. She was using Fire Balls. 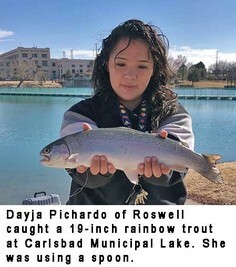 Carlsbad Municipal Lake: Dayja Pichardo of Roswell caught a 19-inch rainbow trout Jan. 16. She was using a spoon. 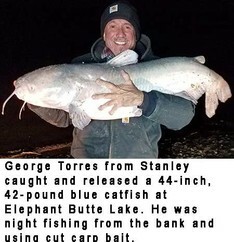 Elephant Butte Lake: George Torres of Stanley caught and released a 44-inch, 42-pound blue catfish Jan. 19. He was night fishing from the bank and using cut carp bait. 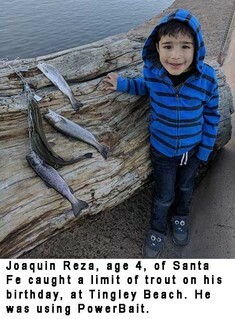 Tingley Beach: Joaquin Reza, age 4, of Santa Fe caught a limit of trout on his birthday, Jan. 19. He was using PowerBait. Cabresto Lake: We had no reports from anglers this week. Charette Lakes: Closed for the season. Cimarron River: Stream flow below Eagle Nest on Monday morning was 2.53 cfs. We had no reports from anglers this week. Clayton Lake: Closed for the season. Conchas Lake: We had no reports from anglers this week. It’s vertical jigging time for walleye here. Give it a try and let us know how you do. Costilla Creek: Mark your calendar to check this one out next spring. Cowles Ponds: Check this one out in the spring for some great trout action. Coyote Creek: We had no reports from anglers this week. Eagle Nest Lake: Ice fishing was good using corn, wax worms, salmon eggs and small ice jigs tipped with a piece of worm, a wax worm, corn or PowerBait for a mixed bag of rainbow trout and perch and an occasional pike and kokanee. As of this past Sunday, the ice thickness was about 14 inches near the south boat ramp. Friends of Eagle Nest Lake and Cimarron Canyon State Parks are sponsoring an Ice Fishing Tournament January 26. Daytime contact is JB at (337) 485-3722 or Roy in the evenings at (505) 859-2236 for more information. REMINDER TO ALL ANGLERS: Chumming is illegal on all trout waters. Eagle Rock Lake: We had no reports from anglers this week. Fawn Lakes: We had no reports from anglers this week. Gallinas River: We had no reports from anglers this week. Lake Alice: The lake remains closed to fishing at this time, due to dangerous ice conditions. For updated conditions, call the state park office at (575) 445-5607. Lake Maloya: The lake remains closed to fishing at this time, due to dangerous ice conditions. For updated conditions, call the state park office at (575) 445-5607. Maxwell Lake 13: Closed for the season. Monastery Lake: We had no reports from anglers. The lake is closed to ice fishing. Morphy Lake: Closed for the season. Pecos River: Stream flow near the town of Pecos on Monday morning was 22.9 cfs. Trout fishing in the Villanueva area was very good using copper John Barrs and salmon eggs. 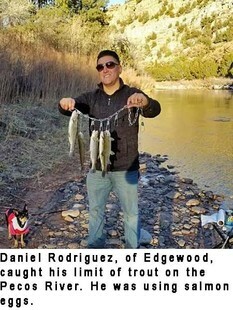 Daniel Rodriguez of Edgewood caught his limit within 30 minutes this past week. He was using salmon eggs. Red River: Stream flow below the hatchery on Monday morning was 20.2 cfs. Fishing was good using PowerBait and small bead head nymphs for trout. Rio Grande: Stream flow at the Taos Junction Bridge was 336 cfs. Fishing was fair using weighed wooly buggers, copper John Barrs wax worms and salmon eggs for trout. Fishing pressure was light. We had no reports on other species. Rio Hondo: We had no reports from anglers this week. Rio Mora: Stream flow on Monday morning was 5.50 cfs. We had no reports from anglers this week. Rio Pueblo: We had no reports from anglers this week. Santa Cruz Reservoir: The lake is completely covered with ice and snow. No fishing at this time. Shuree Ponds: Closed for the season. Springer Lake: The lake is covered with a thick layer of ice and is closed to ice fishing. Storrie Lake: We had no reports from anglers this week. Stubblefield Lake: We had no reports from anglers this week. Ute Lake: Fishing was slow to fair vertical jigging in 35 to 40 feet of water with blade baits for walleye. We had no reports on other species. Fishing pressure was very light. Abiquiu Lake: About 50 percent of the lake has been covered with a thin layer of ice in the morning hours but clearing off by mid-day. Fishing was slow to fair using slab spoons and blade baits for walleye. We had no reports on other species. The concrete portion of the boat ramp is out of the water. Extreme caution should be used when attempting to launch a boat. Animas River: Water flow below Aztec on Monday morning was 171 cfs. We had no reports from anglers this week. Albuquerque Area Drains: Received good trout fishing reports from all the drains this past week. Anglers did well using wax worms, Fire Balls, PowerBait, San Juan worms, earth worms and small spoons. We had no reports on other species. Bluewater Lake: The lake remains closed to fishing at this time due to dangerous ice conditions. For updated conditions, call the state park office at (505) 876-2391. Brazos River: We had no reports from anglers this week. Canjilon Lakes: We had no reports from anglers this week. Chama River: Monday morning flows below El Vado and Abiquiu were 24.2 cfs and 138 cfs respectively. Trout fishing below Abiquiu was good using small streamers, small bead head nymphs and salmon eggs. We had no reports from below El Vado. Cochiti Lake: We had no reports from anglers this week. El Vado Lake: The lake remains closed to fishing due to thin ice conditions. For updates, call the state park office at (575) 588-7470. Fenton Lake: The lake has opened for ice fishing with an ice thickness of 7.5 to 9 inches. Fishing was very good using wax worms, salmon eggs, earth worms, PowerBait and pink ice jigs tipped with salmon eggs. Heron Lake: The lake remains closed to fishing due to thin ice conditions. For updates, call the state park office at (575) 588-7470. Jackson Lake: We had no reports from anglers this week. Jemez Waters: Stream flow on the Jemez near the town of Jemez on Monday morning was 18.5 cfs. We had no reports from anglers this week. Laguna del Campo: Closed for the season. Lagunitas Lakes: We had no reports from anglers this week. Lake Farmington: We had no reports from anglers this week. Navajo Lake: Fishing remained slow for all species. Fishing pressure was light. San Gregorio Lake: We had no reports from anglers this week. San Juan River: Stream flow below Navajo Lake on Monday morning was 284 cfs. Fishing through the Quality Water area was good using chamois leeches, red and orange San Juan worms, disco midges, red larva, egg patterns, bunny leeches and princess nymphs. Through the bait waters, trout fishing was fair to good using salmon eggs, PowerBait, wooly buggers, egg patterns and worms. Seven Springs Brood Pond: We had no reports from anglers this week. Tingley Beach: Fishing was very good using homemade dough bait, PowerBait, wax worms and salmon eggs for trout. We had no reports on other species. Alumni Pond: Trout fishing was very good with limits of fish caught by anglers using Velveeta cheese, homemade dough baits, salmon eggs and a variety of flies. Bear Canyon Lake: Fishing was fair using PowerBait, Fire Balls, Pistol Petes and spoons for trout. We had no reports on other species. Bill Evans Lake: Fishing was good using PowerBait and homemade dough bait for trout. We had no reports on other species. A few catfish were also caught by anglers fishing for trout. Caballo Lake: Fishing was slow for all species. Fishing pressure was very light. Elephant Butte Lake: Fishing was fair using spoons and blade baits for white bass and an occasional largemouth and walleye. The best reports came from anglers working the south end of the lake. Night fishing was fair using cut bait and homemade dough bait for catfish. We had no reports on other species. Escondida Lake: We had no reports from anglers this week. Gila River: Stream flow on Monday morning was 174 cfs. We had no reports from anglers this week. Glenwood Pond: Fishing was good using PowerBait for trout. Lake Roberts: Fishing was good using PowerBait, homemade dough bait and salmon eggs for trout. Percha Dam: We had no reports from anglers this week. Quemado Lake: We had no reports from anglers this week. Rancho Grande Ponds: Fishing was fair to good using PowerBait for trout. Rio Grande: Stream flow below Elephant Butte Monday morning was 2.25 cfs. Fishing was fair using PowerBait and Fire Balls for trout. We had no reports on other species. Young Pond: Fishing was very good using garlic cheese, corn and PowerBait for trout. The pond will close January 28 for cleaning and repair and is expected to be closed for about a month. Alto Lake: Fishing was good using salmon eggs and PowerBait for trout. 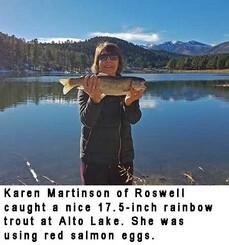 Karen Martinson of Roswell caught a nice 17.5-inch rainbow trout Jan. 19. She was using red salmon eggs. Berrendo Creek: Fishing was good using PowerBait and salmon eggs for trout. Bataan Lake: Fishing was good using Kastmasters, Super Dupers and PowerBait for trout. Black River: Stream flow at Malaga on Monday morning was 14.8 cfs. Fishing was very good using salmon eggs and PowerBait for trout. Blue Hole Park Pond: Fishing was very good using PowerBait, homemade dough bait and garlic cheese for trout. Bonito Lake: Closed until further notice by the city of Alamogordo due to fire damage. It appears now that the lake will be out of commission until the spring of 2020. Bosque Redondo Lake: Trout fishing was fair to good using Pistol Petes, corn salmon egg combinations and PowerBait. Bottomless Lakes: Fishing was fair to good using PowerBait for trout. Brantley Lake: We had no reports from anglers this week. Carlsbad Municipal Lake: Fishing was very good using PowerBait, salmon eggs, flies under a bubble and spoons for trout. Chaparral Park Lake: Fishing was slow to fair using PowerBait for trout. We had no reports on other species. Corona Pond: We had no reports from anglers this week. El Rito Creek: Fishing was very good using PowerBait, Fire Balls and Pistol Petes for trout. We had no reports on other species. Eunice Lake: We had no reports from anglers this week. Green Meadow Lake: Fishing was slow with just a few trout caught by anglers using PowerBait and salmon eggs. Grindstone Reservoir: Fishing was good using PowerBait and salmon eggs for trout. We had no reports on other species. Jal Lake: Fishing was fair using worms, salmon eggs and PowerBait for trout. Lake Van: Fishing was good using PowerBait, Fire Balls, Kastmasters, Pistol Petes and spinners for trout. We had no reports on other species. Oasis Park Lake: We had no reports from anglers this week. Pecos River: Stream flow below Sumner Lake on Monday morning was 15.5 cfs. Fishing was fair using PowerBait, worms and salmon eggs for trout. We had no reports on other species. Perch Lake: Fishing was very good using Pistol Petes, small spoons, Fire Balls, PowerBait and custom tied nymphs for trout. Ruidoso River: Stream flow on Monday morning at Hollywood was 13.2 cfs. Fishing was slow to fair using salmon eggs for trout. Santa Rosa Lake: We had no reports from anglers this week. Sumner Lake: We had no reports from anglers this week.